The CIKA Coach Drive from Port Fairy in Western Victoria to the Royal Children’s Hospital in North Melbourne, a distance of around 300 km, took eleven days from April 10 to April 20 and raised $71,695.10. It took a huge amount of planning and involved hundreds of people along the way. The 2013 Port Fairy to Melbourne coach drive was planned and executed by long-time CIKA supporters Steve Taranto, Andrew and Christine Duyvestyn, their family and their loyal band of helpers. As if the Wood Days are not enough, the Duyvestyn family organised a fund-raising coach drive from the Western District to Melbourne. 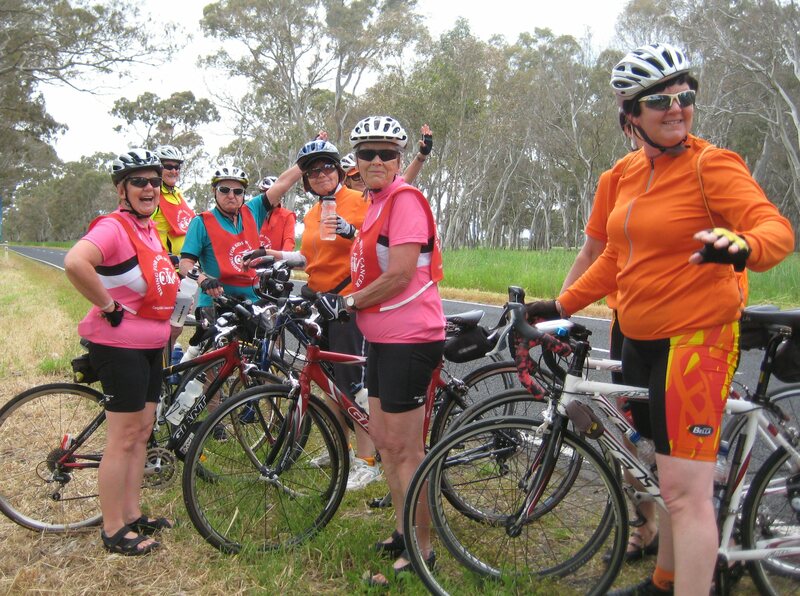 Starting from Port fairy on Wednesday 10th April 2013, it arrived at the Royal Children’s Hospital on Saturday 20th. Here is a report on this amazing event, written by CIKA president Sandra Lehrer. into solid cancerous tumours. Some members had been talking for years about doing a Coach Drive so the challenge was on. What an overwhelming success it was, and the credit for this must go to the many people who helped put this fundraiser together. The logistics of this event were enormous so let me take you on the journey. 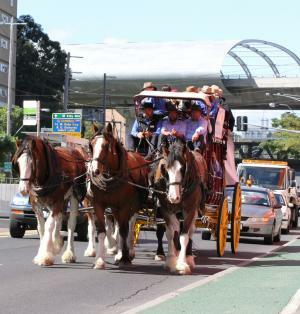 When the discussion of the drive began, the main concerns were the management of the eight horses, the length of the journey and the safety of all involved. 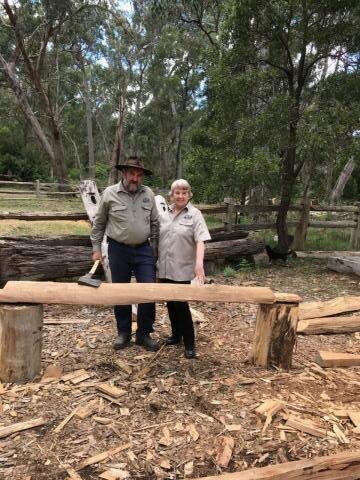 Christine and Andrew Duyvestyn together with Steve Taranto drove from Port Fairy to Melbourne to establish the best route to take and one that would take advantage of local camping and yarding facilities. 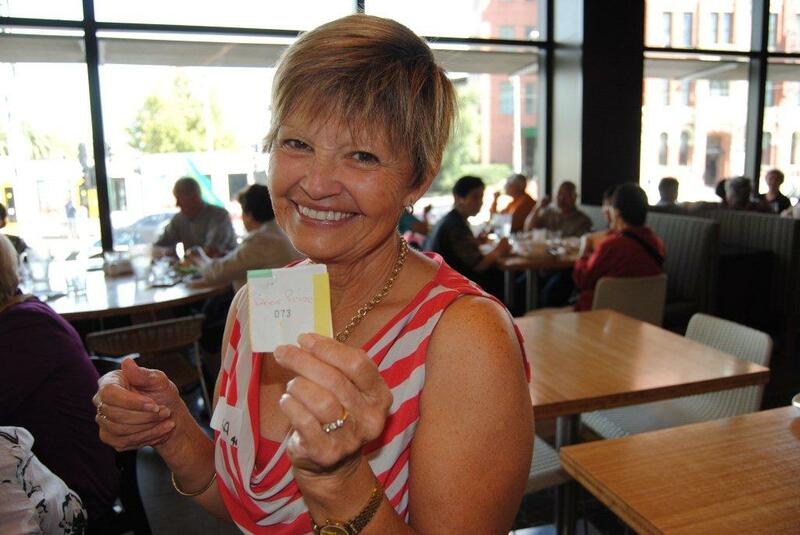 Christine, who is President of the Lions Club of Macarthur, then approached the members of the 201 V2 Lions District who wholeheartedly supported the venture. A small committee was formed and from then on it was all go. First to step up were the members of the Wheatlands’ Museum at Warracknabeal who cut and bagged chaff together with barley hay generously donated by Geoff and Lorraine Inkster, a great start for the horse feed. Steve Taranto was out of the blocks very quickly garnering generous donations from The Mornington Peninsula area and we were overwhelmed with the enthusiasm and support that we received from so many businesses and individuals. We needed to promote this event and Ellie and Caitlin at the RCH designed and created the website, and put together a collection of postcards and bookmarks as well as a colouring in competition and a promotional booklet. A very big thanks must go to the people at Briamar Press who did not flinch at the quantity of print, and it was a most generous donation to this event. Unflappable CIKA member Fred Bergman organized banners for the horses trucks and for the Coach. What to wear? Sandra made phone calls to various companies one of which replied with great enthusiasm. Paula from R.B.Sellars said that it would be an honour to outfit the crew, so colour combinations were selected, logo designed and the crew of fifteen were measured up for shirts and trousers for the whole trip. The next decision was how to feed this mob en route. While all fifteen were happy to meet their own costs it was felt that, where possible, we would supply breakfast, lunch and the evening meal. Through their work contacts the Duyvestyn Family were able to secure the support of PFD Food Services who donated food to the value of $1,500 that covered the breakfasts, and morning and afternoon teas. Nick Kerr from Farm Foods supplied meat for some dinners. The Lions Club came on board in a huge way and as the trip unfolded it was apparent that in every town that we visited where there was a lions Club they would support us. Day 1. Port Fairy. 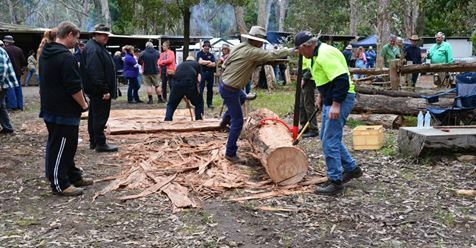 A farewell from the local community was organised by the Port Fairy Belfast Lions Club and the local Moyne Shire for which we thank Mayor Jimmy Doukas. Many of the local residents gathered at the departure point at Railway to hear the speeches and to partake of the cooked breakfast that was on offer. CIKA received many donations here and we are particularly grateful to all the generous folk at Port Fairy. The journey was underway with four cars, a horse truck and four caravans. On average the horses would cover about forty kilometres a day and would be swapped over at regular intervals. The first stop was Tower Hill and what a sight to behold. Members of the local Lions Club had erected a tent at the pull-off and a delicious lunch was provided for the crew. Then it was on to the overnight stop at Warrnambool. We changed horses in a local reserve where we welcomed donations from the locals. Camp was set up at David Blaxland’s property and then it was off to the Warrnambool Lions for dinner, a lovely meal in great company. Day 2. 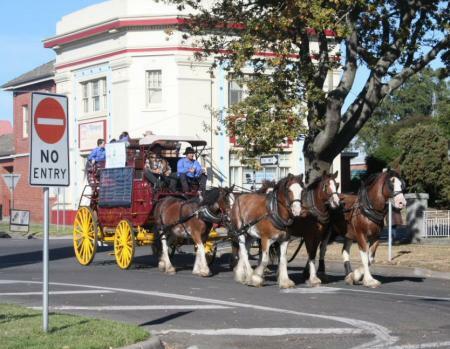 The trip to Terang was pleasant; we all had our jobs to do and we all fell into them very quickly. Lunch was at Garvoc, provided by the Lions Club of Terang, and, after another couple of hours on the road we arrived at Terang and made camp at the Emu Creek Pony Club where a dinner and get together had been organised. Day 3. The first stop was at the Model Toy Barn at McKinnons Bridge then it was on to a warm welcome in the lovely town of Camperdown. When we arrived the horses were changed in the street and the locals loved it. 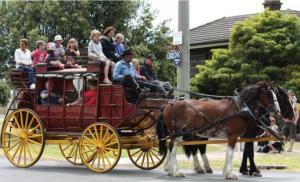 Coach rides were given, the shaker tins were taken up the street and, as a special request, we visited Sunnyside House. Some of the residents were bought outside and for many it was “stories to tell ” when the coach and horses arrived. Our overnight camp was at the local showgrounds and a big thanks to David from the Camperdown Lions Club for cooking dinner for the crew. Day 4. On the way to Colac, we stopped at Mt Pomborneet for a cuppa and then on to Pirron Yallock Pub. (Hi and thanks to Shannon, Karen and children.) We created a lot of interest in Colac’s main street and, after donations were collected, we set up camp at the local showgrounds. The Lions Club had pulled out all stops for the evening meal thanks to which we had a wonderful evening and met some terrific people. Day 5. 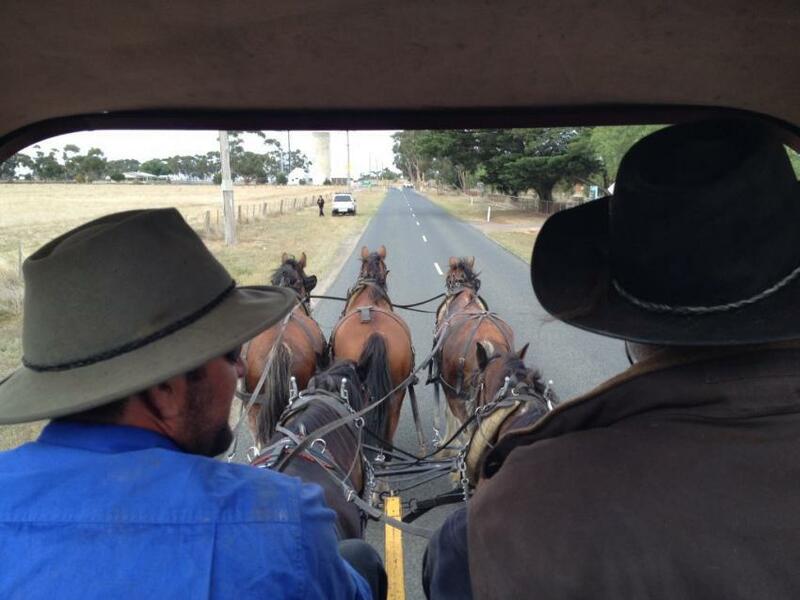 On the road to Birregurra, Dan Tehan and his daughter caught up with us and enjoyed a ride on the Coach. From there it was a quiet trip to the Wurdiboluc Reservoir to set up set up camp and enjoy a wonderful meal cooked by Dean Duyvestyn, a treat up for all of us. Day 6. Into the seaside town of Torquay and what a great reception; the shaker tins filled fast and so many donations were received. Andrew and Steve were very busy taking the many parents and children for rides around town. After setting up camp at Torquay sportsgrounds, and polished up in our evening RB Sellars, we enjoyed a meal at the Torquay Hotel with some of the local Lions Club members. Thanks to Michelle and Brett for organizing the raffles held at both the Beach Hotel and Torquay Hotel to raise even more money for us. Day 7. An early start; it was to be a long day. The first stop was near the Highton Primary School which is attended by young Annie Duyvestyn, another CIKA supporter. Several classes were brought to look at the coach and horses and Andrew spent a lot of time talking to the children about the rig. The next visit was to the Fyans Park Primary School; the whole school had taken on this event with great enthusiasm and what a sight to behold when we came into the grounds. All the children were dressed in period costume. There were some truly amazing hats being worn, and, as it was Finn’s school, he proudly drove the Coach around the oval. The crew received great support throughout the day from Highton Village Florist, George at Bellevue Dry Cleaners and Porter Hot Bread Kitchen, for which we are extremely grateful. To top it off, and a lovely lunch was supplied by the Geelong West Lions. Camp was made at Beckley Park and once the horses were settled we were spruced up for a get together at Oppys in Norlane. Our thanks to Sandra Fountain from the Corio/Norlane Lions Club for organizing this event and for all the local supporters who attended. Day 8. The Road House Cafe at Corio Bay offered to cook breakfast for the entire crew and it was a welcome start to the day. We had a terrific visit to Lara Primary School where, for many of the children, it was an unique experience. Lunch was provided by the Lions Club of Lara after which we also took the opportunity to visit Boomaroo Nurseries, one of our sponsors, and then it was on to Little River where a visit to the local primary school had been organised. It was one of the greatest pleasures of this trip to see the enjoyment that so many children obtained from seeing the coach and horses. Local people Sue and John Frattin had offered the use of their land for the camp and their generous hospitality was very much appreciated, as was the wonderful evening meal supplied by the family. The Lions Club of Little River had a barbeque at the local railway station, and, again, Coach rides were given. Day 9. 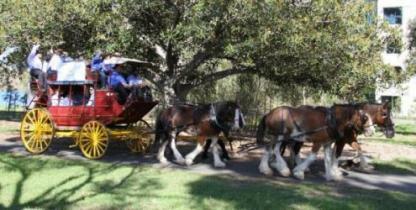 With Melbourne in sight, two camps were to be established: the horse coach and truck to E.E. Muir and Sons at Laverton and the crew to Peter and Ruth Murray’s warehouse facility at Hoppers Crossing. Day 10. 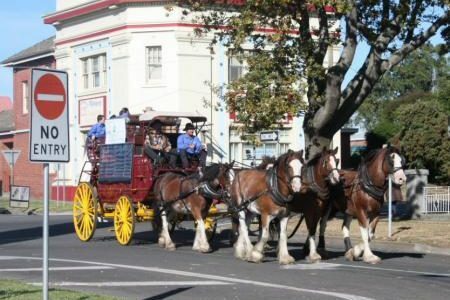 It was time to bring the coach into the Royal Melbourne Showgrounds and the challenge was to get it and horses there safely. We created a lot of interest along the Old Geelong Road and most motorists were very patient with us. After a strenuous day it was wonderful to enjoy a lovely dinner and a great catch up with the West Footscray Lions Club. Day 11. What would the Melbourne weather do? Perfect, of course. It was agreed that the entire crew would be in the coach for the trip into the RCH so, in our best RB Sellars, gear we set of from the showgrounds. It was a great finish to a long journey, one that had taken two years to plan. The sight of the coach and five horses coming into Royal Park must have been magnificent for the many family and friends who were there to watch. 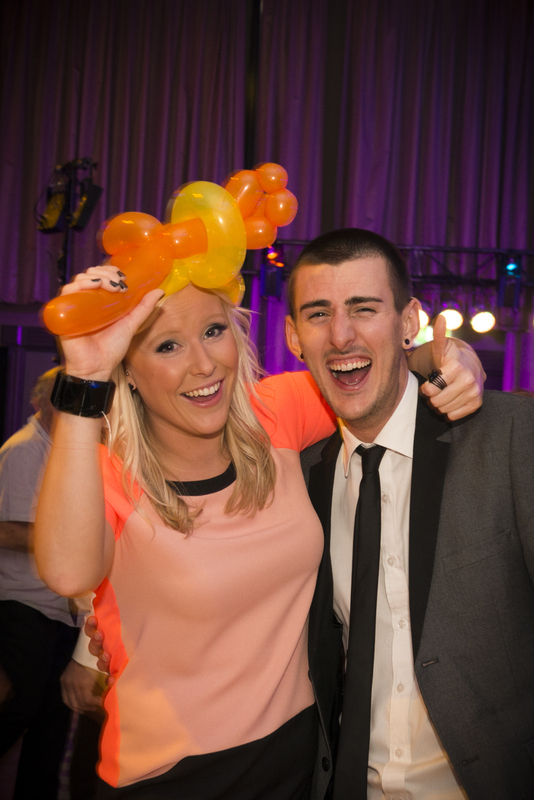 Also in attendance were representatives of the hospital and Murdoch Cancer Research Institute. CIKA patron, Peter Mitchell, was there to welcome us and to receive the gold bullion that we had carried with us. It was a great finish to the trip. Our thanks to the Melbourne City Council, and especially Event Coordinator Susie Lunt, for all their help in facilitating the arrival at the RCH. To our delight, the event was reported on the Channel 7 News. Many people contributed to the success of this activity. Along the route all of the Lions Clubs involved provided meals, support and cheques. The local communities were very generous and embraced the difference with this fundraiser. Above all, the journey would not have been possible without the dedication and hard work of the crew members, all of whom took time off work. They truly are defining exemplars of the concept of “volunteer”. Andrew Duyvestyn: Horse management, coach driver, logistics. Christine Duyvestyn: All co-ordination with the Lions Clubs meals and general dogsbody. Steve Taranto: Horse management, coach driver, logistics. Dean Duyvestyn: Photographer, meals and management of the Facebook page. 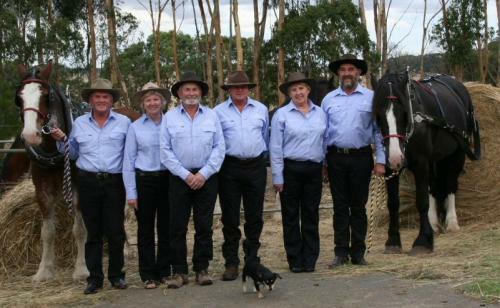 John Holcombe: Horse management and humour. Chris Thomas: Truck driver and trouble shooter. Tony McNamara: Horse management and philosophy. Jenenne and Trevor Kingwill: Safety support vehicle and retrieval of horse poo. Sandra and Steve Lehrer: set up and sale of merchandise. Bailey and Ashlee Duyvestyn: cleaned out the trucks brushed the horses. Annabelle Duyvestyn and Finn Grant: collected horse poo, assisted the drivers and were the best tin shakers in every town we went through. trip and were very quick to put their hands up to support us financially. And we also thank all those kind caring and interesting people we met along the way. Postscript. Even before the coach and its crew set out, the event had already raised over $30,000 from generous sponsors and donors. On arrival in Melbourne it had passed its goal, raising $55,000, and a month later donations were still coming in to swell the total to $60,000. The microscope was purchased in May but the donations just did not stop. 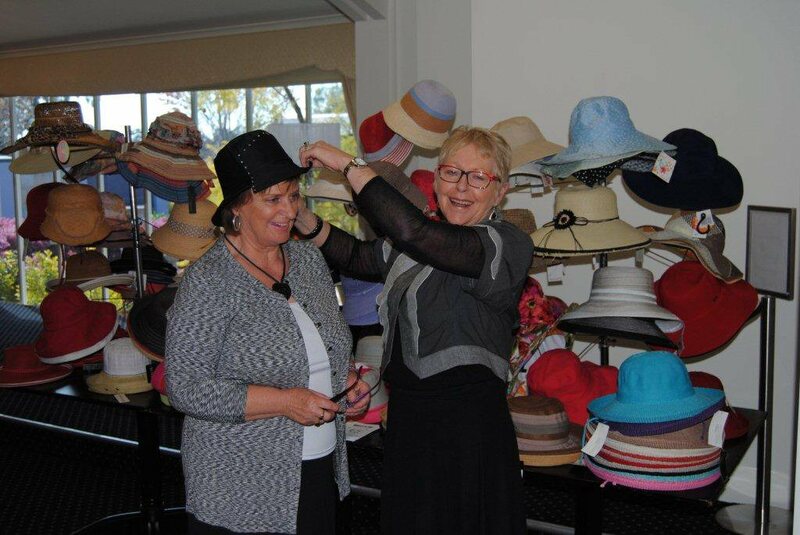 The final Coach Drive event took place on the Mornington Peninsula on 25 May. A “Black & White Charity Nite” run by the “Cruisers”, a small team of long time car enthusiasts who get together to develop social activities, raised $10,650, bringing the total to $72,833.10. The state-of-the-art Leica Microscope is now being used for solid tumour research. For information about the microscope, please click here. Not only did the Coach Drive fund the purchase of the microscope, it also raised awareness of solid cancerous tumours in children. This event would not have been possible without the support of our generous sponsors. CIKA would like to acknowledge the following organisations for their contributions. Please support them as they have supported us. You can visit their web pages or obtain their contact details by clicking on the links below.